- Blue (wavelength: 400nm-520nm): Help plants grow, supplement light of growth. - Red (wavelength: 610nm-720nm): Help plants grow, supplement light of growth and is the key for flowering plants. - Please make this LED grow lights work at proper working environment (-20~+40℃). HOLA Plant Grow Lights: Suitable for plants growing, budding, blooming and fruiting. Not only promoting the growth of plants, but also increasing plants yields. Solving problems of inadequate sunshine. Professional Spectrum: Light appearance is white light (similar to pink) with spectrum red (610nm-720nm) + blue (400nm-520nm). Professional light proportion of red and blue rays, providing better light environment to plants. 360 Degrees Beam Angle: Fully clear glass shell transmits 360 degrees white light to plants, helping to direct heat, keep appropriate lighting for plant growth and provide maximum coverage. 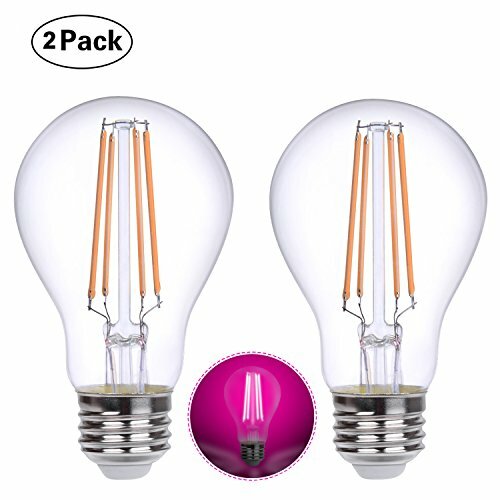 Energy-Saving & High Quality: Low power consumption (6 Watts equivalent to 60W incandescent bulb), save electricity. Overall service life can achieve to over 15,000 hrs, providing your plants with continuous light like summer sunlight even in winter. If you have any questions about this product by HOLA, contact us by completing and submitting the form below. If you are looking for a specif part number, please include it with your message.